NSAIDs (non-steroidal anti-inflammatory drugs) including ibuprofen, naproxen, diclofenac, celecoxib and indomethacin can decrease pain. Take them for the shortest possible time as they can be harmful. Should you use NSAIDs? If you must get back to work ASAP then consider the risks vs. benefits. Talk to your pharmacist and physician (MD). Acute ligament sprain – use for < 5 days. NSAIDs reduce pain and swelling so you can return to activity faster. Delayed onset muscle soreness. When taken for several days before muscle damaging exercise, NSAIDs may reduce soreness. Take with caution as they can wreck your strength gains (see below). Muscle bruise (contusion). Short term use can decrease inflammation with no adverse effects on healing. Tendonitis – reduces inflammation and helps recovery. NSAIDs may do more harm than good for chronic tendon issues. Short-term low dose (400 mg ibuprofen) use may have no real impact on muscle strength or size. Longer term, higher doses (1,200 mg ibuprofen) may compromise muscle growth and, when training was preformed with all-out max reps, strength gains were also compromised. The elderly may benefit due to a decrease in inflammation from taking NSAIDs. Chronic inflammation, which is not uncommon in the elderly, impairs strength gains. NSAIDs help tame inflammation. 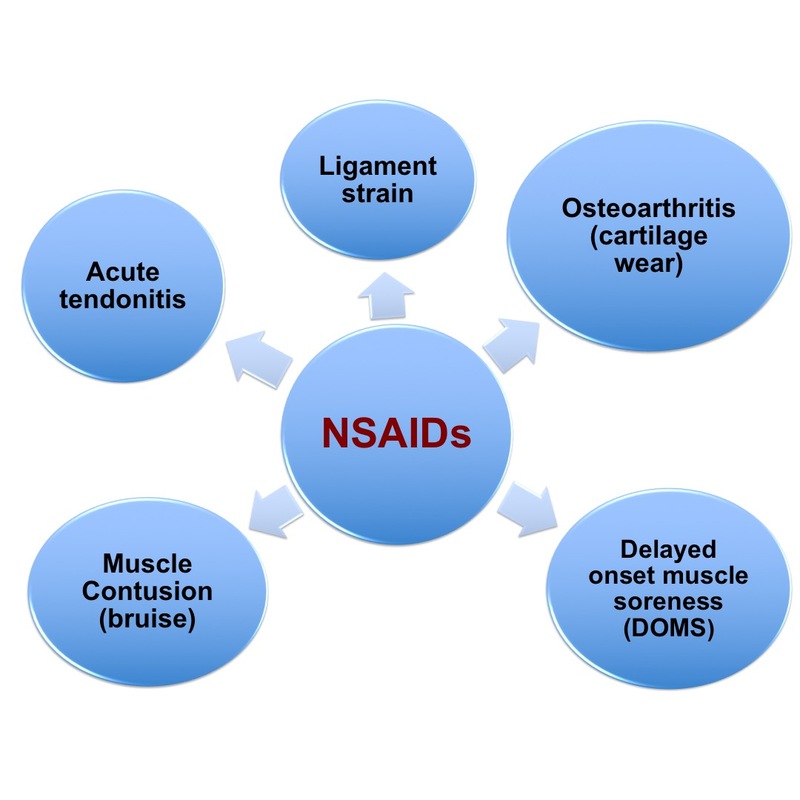 After muscle injuries, NSAIDs can help reduce strength loss, soreness and muscle markers of inflammation, particularly when lower body muscles are injured. Why do NSAIDs Impact Training (Strength) Gains? NSAIDs work by blocking COX enzymes. COX enzymes alter prostaglandin synthesis, mediators of inflammation and pain. Prostaglandins have other actions in the body including regulation of muscle protein metabolism. Decreases in the prostaglandin PGF2α are associated with decreased protein synthesis and reduced muscle fiber size. In one study, 1200 mg ibuprofen blocked protein synthesis after resistance training. Other studies show signaling responses in muscle are decreased for hours or days after resistance training when NSAIDs are used. Arthritis Res Ther 2013;15(Suppl 3):S2. Annals of Phys and Rehab Med 2010;278-288. Am J Sports Med 2004;32(8):1856-9. Am J Physiol Endocrinol Metab 2002;282(3):E551-6. J Physiol 2009;587(Pt 24): 5799-5800. Am J Sports Med 2018;46(1):224-233. Eat fewer calories than you burn each day and you’ll lose weight. There’s one major issue with this time-tested approach: you’ll probably strip away more than just body fat. 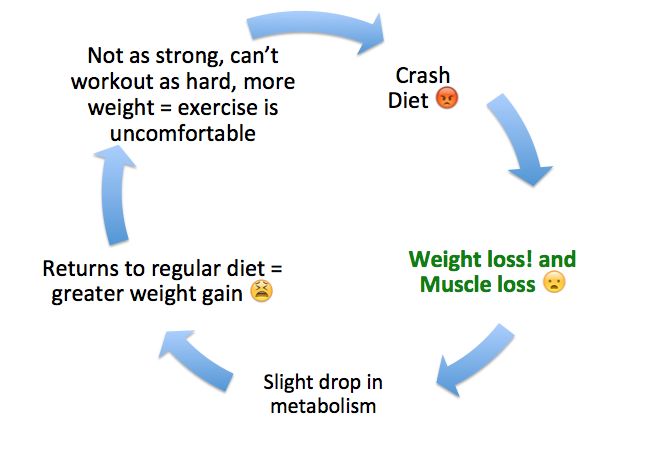 Weight loss, especially fast weight loss, achieved after crash dieting or drastically slashing calorie intake, leads to a decrease in muscle mass and subsequent drop in metabolism. A slower metabolism means your body needs even fewer calories to maintain your new weight (weight loss alone = fewer calories needed to carry around a smaller body, add muscle loss and your calorie needs drop even more). In addition, with less muscle you won’t be able to push yourself as hard during workouts (and therefore burn as many calories). This can put you on the fast track to yo-yo dieting, weight loss and regain. There’s a much better approach and a recently published study highlights how you can lose body fat and gain muscle at the same time. How you can keep the weight off. When you eat fewer calories than you need each day, your body is forced to pull from its backup supply, body fat and muscle, to maintain your energy (calorie) needs. Some people lose a substantial amount of muscle when dieting, 30% or more, of their initial muscle mass. In addition to a decrease in muscle mass and slower metabolism, lower calorie diets decrease the intracellular signaling necessary for the synthesis of new proteins in muscle. Plus, muscle tissue may be less sensitive to protein when you’re dieting. In other words, it’s really tough to build muscle when dieting to lose weight. Based on these physiological changes, there’s an age-old theory suggesting it’s impossible to gain muscle and lose fat at the same time. However, scientists from McMaster University in Canada found it is not only possible but also, doable even when losing a substantial amount of body fat in a relatively short period of time. Supervised workouts consisted of full-body resistance circuit training twice per week and high intensity interval training six days per week. In addition to their structured exercise program, all participants were instructed to get at least 10,000 steps per day as monitored by a pedometer worn on their hip. Both the lower protein and higher protein groups lost weight with no significant difference between groups. Men in the higher protein group gained 2.64 lbs. of muscle and lost 10.56 lbs. of body fat while men in the control group gained little muscle (0.22 lbs.) and lost 7.7 lbs. of fat. Both groups improved all but one measure of strength in addition to aerobic and anaerobic capacity. There were no differences between groups in strength, power, aerobic fitness or performance at the end of the study. In this study, a higher protein, reduced calorie diet combined with a high intensity circuit-training program including interval training and sprints helped participants build muscle. In addition to their total protein intake, participants in the higher protein group also consumed more protein per meal (approximately 49 grams per meal) than those in the lower protein group (approximately 22 grams per meal). Why Didn’t They Cut Carbohydrates? Low carbohydrate diets are not only popular, but they may lead to greater weight loss (in overweight and obese individuals), initially, than higher carbohydrate, low fat diets (some of this is water weight). However, when giving up carbohydrates you also sacrifice something else, intense training. Carbohydrates are the primary source of fuel used during high-intensity exercise because your body can readily access and utilize them for energy. Fat is a slow source of energy and therefore, your body cannot access and use fat quickly enough to sustain high intensity training. In this study, both groups of participants consumed 50% of their calorie intake from carbohydrate. If the study authors cut carbohydrates, the participants wouldn’t make it through their high intensity training program that was specifically designed to take off fat and increase muscle mass. Consider a program like the one used in this study a short-term jumpstart. It isn’t sustainable over a long period of time. The transition to a longer-term approach after weight loss should include a gradual increase in calorie intake while maintaining a higher protein diet (at least 0.55 grams of protein per lb. of body weight to maintain muscle while considerably more, along the lines of 1.09 – 1.41 grams of protein per lb. of body weight may be necessary to continue building muscle during periods of reduced calorie intake). This gradual increase in calorie intake is important because substantial weight loss results in a slower metabolism even if you maintain or build muscle during your jumpstart weight loss program. It isn’t entirely clear why this happens and the drop is greater than scientists can predict based on a decrease in muscle mass. Even if you build some muscle, this won’t rev fire up your metabolism to make up for a drastic decrease in body weight. One pound of muscle burns a measly 5.9 calories per day at rest while a pound of fat burns 2 calories per day at rest. Greater weight lost while dieting means an even greater drop in metabolism – something dieters must account for so they can maintain their new weight. In addition to slowly increasing calorie intake and consuming a higher protein diet, each meal should contain at least 25 – 30 grams of protein. We don’t know the exact amount of protein per meal needed to maximally stimulate muscle building. Your exercise regimen should continue to include resistance training and you’d be wise to continually vary your training program. Be sure to move each day as well. Research shows many people naturally adjust to greater amounts of aerobic exercise by decreasing their activities of daily living. They exercise intensely at the gym and then sit the rest of the day. Circumvent this by using one of the many devices that counts steps each day. Also, consider doing more work around your house including cleaning, mowing your lawn, gardening, and washing your car. Get moving and stay moving all day long. If you want to get rid of your love handles while building a six-pack at the same time, combine an effective resistance training and high intensity interval-training program with a reduced calorie, higher protein diet. Your diet and exercise program does not need to be as rigorous as the one in this study. Instead, you can adjust the McMaster University approach to fit your lifestyle, though your results may take more time. Once you reach your goal weight, slowly transition your training program and diet to an approach you can live with. Weinheimer EM, Sands LP, Campbell WW. A systematic review of the separate and combined effects of energy restriction and exercise on fat free mass in middle-aged and older adults: implications for sarcopenic obesity. Nutr Rev 2010;68:375–88. Stiegler P, Cunliffe A. The role of diet and exercise for the maintenance of fat-free mass and resting metabolic rate during weight loss. Sports Med 2006;36(3):239-62. Heymsfield SB, Gonzalez MCC, Shen W, Redman L, Thomas D. Weight Loss Composition is One-Fourth Fat-Free Mass: A Critical Review and Critique of This Widely Cited Rule. Obes Rev 2014; 15(4):310–321. Deurenberg P, Weststrate JA, Hautvast JG. Changes in fat-free mass during weight loss measured by bioelectrical impedance and by densitometry. Am J Clin Nutr 1989;49(1):33-6. Johannsen DL, Knuth ND, Huizenga R, Rood JC, Ravussin E, Hall KD. Metabolic Slowing with Massive Weight Loss despite Preservation of Fat-Free Mass. J Clin Endocrinol Metab 2012; 97(7): 2489–2496. Ravussin E, Bogardus C. Review Relationship of genetics, age, and physical fitness to daily energy expenditure and fuel utilization. Am J Clin Nutr 1989; 49(5 Suppl):968-75. Phillips SM. A Brief Review of Higher Dietary Protein Diets in Weight Loss: A Focus on Athletes. Sports Med 2014; 44(Suppl 2): 149–153. Longland T, Oikawa SY, Mitchell CJ, Devries MC, Phillips S. Higher compared with lower dietary protein during an energy deficit combined with intense exercise promotes greater lean mass gain and fat mass loss: a randomized trial. Am J Clin Nutr 2016;103:738-46. Heydari M, Freund J, Boutcher SH. The effect of high-intensity intermittent exercise on body composition of overweight young males. J Obes 2012;2012:480467. Areta JL, Burke LM, Camera DM, West DW, Crawshay S, Moore DR,Stellingwerff T, Phillips SM, Hawley JA, Coffey VG. Reduced resting skeletal muscle protein synthesis is rescued by resistance exercise and protein ingestion following short-term energy deficit. Am J Physiol Endocrinol Metab 2014;306:E989–97. Pasiakos SM, Vislocky LM, Carbone JW, Altieri N, Konopelski K, Freake HC, Anderson JM, Ferrando AA, Wolfe RR, Rodriguez NR. Acute energy deprivation affects skeletal muscle protein synthesis and associated intracellular signaling proteins in physically active adults. J Nutr 2010;140:745–51. Hector AJ, Marcotte GR, Churchward-Venne TA, Murphy CH, Breen, von AM, Baker SK, Phillips SM. Whey protein supplementation preserves postprandial myofibrillar protein synthesis during short-term energy restriction in overweight and obese adults. J Nutr 2015;145:246–52. Murphy CH, Churchward-Venne TA, Mitchell CJ, Kolar NM, KassisA, Karagounis LG, Burke LM, Hawley JA, Phillips SM. Hypoenergetic diet-induced reductions in myofibrillar protein synthesis are restored with resistance training and balanced daily protein ingestion in older men. Am J Physiol Endocrinol Metab 2015;308:E734–43. Chaston TB, Dixon JB, O’Brien PE. Changes in fat-free mass during significant weight loss: a systematic review. Int J Obes (Lond) 2007; 31(5):743-50. Garthe I, Raastad T, Refsnes PE, Koivisto A, Sundgot-Borgen J. Effect of two different weight-loss rates on body composition and strength and power-related performance in elite athletes. Int J Sport Nutr Exerc Metab 2011; 21(2):97-104. Churchward-Venne TA, Murphy CH, Longland TM, Phillips SM. Role of protein and amino acids in promoting lean mass accretion with resistance exercise and attenuating lean mass loss during energy deficit in humans. Amino Acids 2013; 45(2):231-40. Helms ER, Zinn C, Rowlands DS, Brown SR. A systematic review of dietary protein during caloric restriction in resistance trained lean athletes: a case for higher intakes. Int J Sport Nutr Exerc Metab 2014; 24(2):127-38. Posted on May 10, 2016 May 13, 2016 Categories Muscle, weight lossTags body fat, body weight, calories, carbohydrates, crash diet, crash dieting, dairy, higher protein group, intense training, lower protein group, macronutrients, mcMaster University, metabolism, muscle, muscle loss, muscle mass, protein, resistance training, slower metabolism, Sprint interval training, strength, training intensity, training program, weight, weight loss6 Comments on Can You Lose Fat and Gain Muscle at the Same Time?